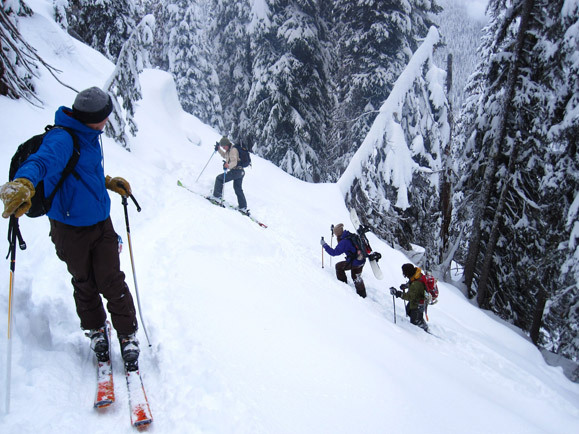 Members of the UBC Varsity Outdoors Club Okanagan "earn their turns" in the high country near Revelstoke. The club is on a no-footprint ski trip to the Rogers Pass area this weekend. A group of UBC Okanagan students are taking a back-country ski trip one step further this weekend -- they're erasing the ecological footprint they create, so their trip has virtually zero environmental impact. The "Earn Your Turns" Zero-Footprint Ski Trip was conceived by students in the UBC Varsity Outdoor Club - Okanagan (VOCO) who are deeply involved in outdoor recreation and have seen first-hand the effects of climate change on winters in the region. "I came from Alaska to UBC Okanagan because of UBC's reputation for sustainable initiatives," says Nick Therrien, VOCO president. "I'm excited to see these values applied to a broad range of activities at UBC Okanagan." With the support of UBC Okanagan's Office of Workplace Health and Sustainability, and working with UBCO goBEYOND campus coordinator Mallory Hewlko, the students have taken several initiatives to lower their impact. Instead of travelling to a nearby resort, they decided to hike, snowshoe and ski in the Rogers Pass area to truly "earn their turns" in the B.C. back-country. They are carpooling to a propane-heated Alpine Club of Canada hut 2 km off Highway 1 and will enjoy a locally sourced feast sponsored by Urban Harvest and Tree Brewing. In addition, in the week leading up to the trip, students participated in two short seminars on the impact climate change is having on the snowpack in British Columbia and the importance of being conscious of ones carbon footprint. "By taking these steps, we hope to inspire other student groups to follow suit," says Hewlko. To help the students achieve a zero footprint by offsetting remaining transportation costs, the University's Office of Workplace Health and Sustainability is funding a light bulb exchange program on campus to provide compact fluorescent light bulbs to the campus community. Even the used light bulbs will be put to good use: one of the participants is a Fine Arts student who will be using them in an art installation. "I really wanted to support the students' efforts toward a carbon-neutral ski trip," says Leanne Bilodeau, who manages health and sustainability at UBC Okanagan. "A light bulb exchange program will build another layer of education and awareness for the students and members of the campus community about how everyone can contribute to lowering our impact on the environment." As 2010 quickly approaches, so too does the B.C. government's mandate for public institutions to be carbon neutral, notes Jackie Podger, Associate Vice President of Administration and Finance at UBC Okanagan. "Supporting this student initiative is one of the ways we can demonstrate our commitment to sustainability -- by helping student groups be leaders of change in Canada," says Podger.